HVAC Contractor Pierrefonds | About JCD | JCD Refrigeration Inc. Serving Montreal's residential, commercial and industrial sectors since 1994, JCD Refrigeration Inc. has the expertise needed to install, repair and maintain all types of heating, cooling, and ventilation systems. Let us show you how our rapid service response times, quality workmanship and focus on customer satisfaction set us apart. At JCD Refrigeration Inc., you will find people who are reliable, honest and value your time as much as you do. We are committed to providing our clients with personable service, as well as ensuring that their homes and businesses are able to benefit from the highest standard of air quality and climate control. A certified Lennox® dealer, we install and repair all brands of climate control and ventilation equipment such as heat pumps, air-conditioners and electric and gas furnaces. Our skilled team will assist you in choosing the right system for your application, and ensure a professional installation that will exceed your expectations and leave you satisfied. It is our quality workmanship and attention to detail that has allowed us to gain the majority of our customers from client referrals. We strive to maintain this by continuously improving the products and services we offer. Located in the West Island, we service areas such as Pierrefonds, Kirkland, Beaconsfield, Dollard-des-Ormeaux, Baie d'Urfé, Pointe-Claire, Dorval, and Sainte-Anne-de-Bellevue, as well as the Greater Montreal Area, including Laval, the South Shore, and off-island areas such as Vaudreuil-Dorion, Saint-Lazare, Hudson, L'Île-Perrot, Blainville, Terrebonne and Mirabel. 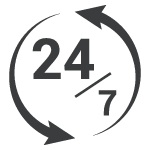 We value our customers comfort and safety, which is why we offer emergency repair service 24/7/365. Contact us today to let us show you why we are Montreal's Most Trusted HVAC Contractor.